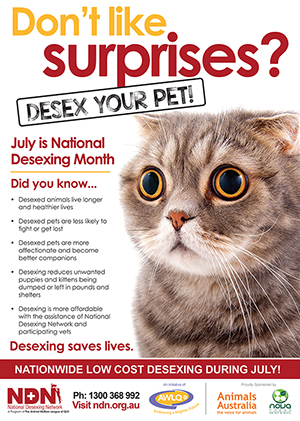 The National Desexing Network (NDN) is a nationwide referral system for discounted desexing made available to pet owners in financial need. Our goal is to end pet overpopulation by making this service more affordable to those who might not otherwise be in a position to desex their pets. Australia has one of the highest rates of pet ownership in the world. Four out of five Australians have owned a pet at some time and almost two-thirds of Australian households currently own pets. Despite these figures, around 23 cats and dogs die every hour of every day in pounds and shelters nationwide. Due to the ongoing problem of pet overpopulation, these healthy, loving animals are being killed because there are not enough homes available. Established in 2004, NDN has a nationwide network of more than 160 participating veterinary clinics and to date has helped to desex around 200,000 cats and dogs nationwide. Every year in July NDN organises National Desexing Month, which has been a big success since its inaugural year 2005 and has continued to grow from then. During the month, welfare organisations, veterinarians, pounds and councils are invited to participate by encouraging pet owners in their communities to desex their pets before the summer breeding season. Together with parent organisation, the Animal Welfare League of Qld, NDN has also organised four National G2Z Summits to End Companion Animal Overpopulation. The summits aim to bring together all stakeholders to share challenges and effective strategies and to set targets to reduce the numbers of animals euthanased in Australia. NDN is originally based on SPAY/USA, a well established desexing network in America. In the last 18 years, SPAY/USA has facilitated 100,000s desexing procedures, thereby causing a significant drop in the numbers of pets euthanased annually. To date more than 7,000 vets have joined SPAY/USA. NDN is a charitable program funded through the generosity of members of the public who strongly believe in desexing. The only beneficiaries of the program are Australia's cats and dogs.